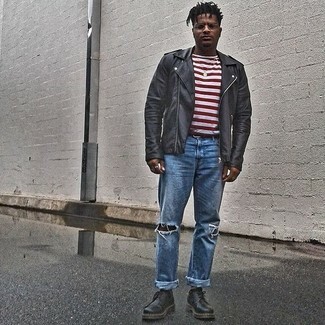 If you're all about relaxed dressing when it comes to fashion, you'll love this easy pairing of a black leather biker jacket and Collusion Straight Leg Jean In Classic Blue Mid Wash With Rips from Asos. Black leather derby shoes will instantly spruce up even the laziest of looks. 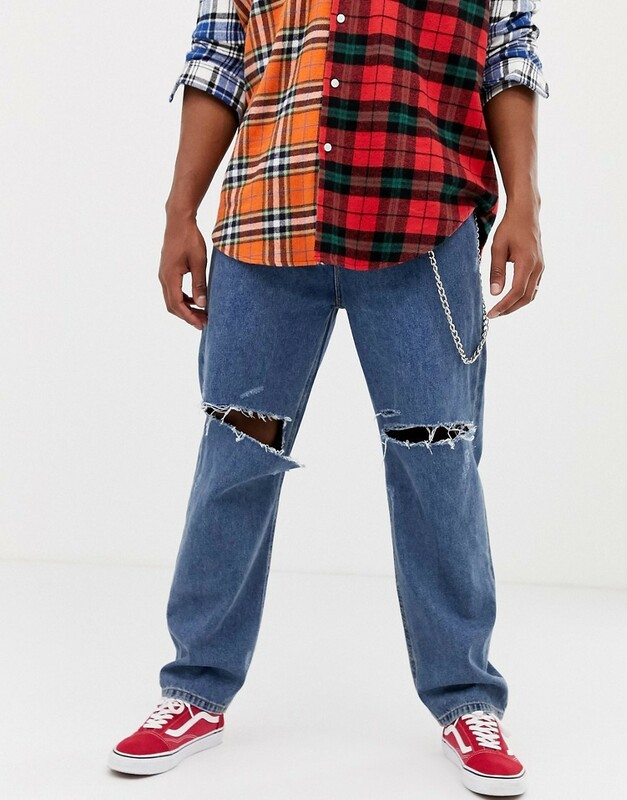 If you're all about feeling relaxed when it comes to picking out an outfit, this combination of a white and red plaid long sleeve shirt and Collusion straight leg jean in classic blue mid wash with rips is what you need. To add more class to your ensemble, finish off with dark brown suede desert boots. We all want comfort when it comes to dressing up, and this combination of a black embroidered leather biker jacket and Collusion straight leg jean in classic blue mid wash with rips is a wonderful example of that. 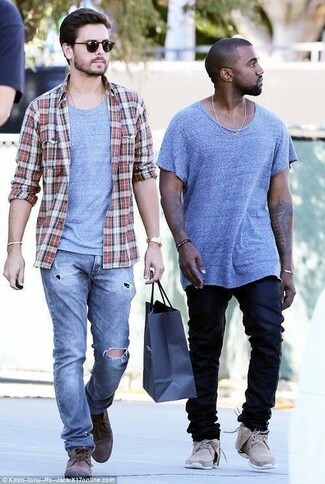 Try teaming a navy and white varsity jacket with blue ripped jeans to be both killer and relaxed. Why not introduce black leather casual boots to the mix for an added touch of style? 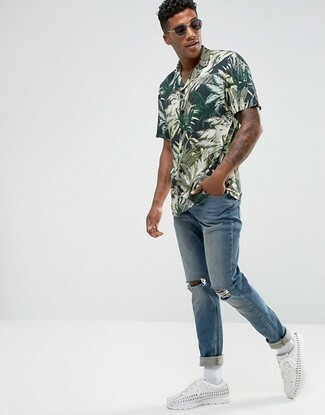 We're all looking for comfort when it comes to dressing up, and this combination of a dark green print short sleeve shirt and Collusion straight leg jean in classic blue mid wash with rips from Asos is a wonderful example of that. Add white leather low top sneakers to your ensemble for an instant style upgrade. If you're on a mission for a casual yet seriously stylish outfit, opt for a navy overcoat and Collusion straight leg jean in classic blue mid wash with rips. Both pieces are totally comfortable and will look great together. For something more on the daring side to complement this outfit, make white high top sneakers your footwear choice. If you prefer practicality dressing when it comes to fashion, you'll love this simple combination of a beige crew-neck sweater and blue ripped jeans. Channel your inner Ryan Gosling and rock a pair of black and white leather brogues to class up your getup. 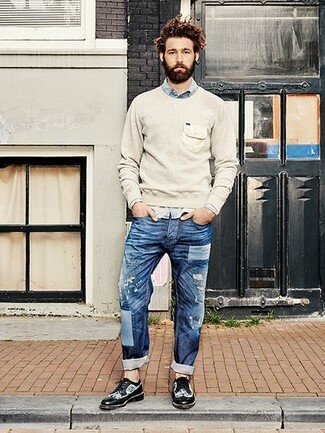 If you prefer relaxed dressing when it comes to fashion, you'll love this stylish pairing of a navy crew-neck sweater and Collusion straight leg jean in classic blue mid wash with rips from Asos. Tap into some David Gandy dapperness and complete your ensemble with navy leather casual boots. If you're after a casual yet on-trend outfit, pair a grey check double breasted blazer with Collusion straight leg jean in classic blue mid wash with rips. Both pieces are totally comfortable and will look great together. Opt for a pair of dark brown leather double monks to kick things up to the next level.